reads "I have no iota of doubt in my mind that our troops will wipe out the insurgents in the shortest possible time and we are committed to this target. 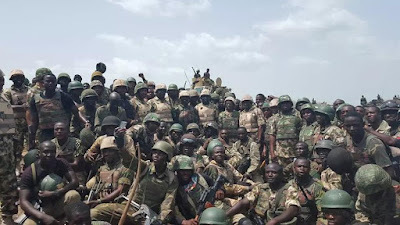 You are aware that our troops recaptured Gamboru Ngala last Tuesday and are now consolidating, mopping up and preparing for the next offensive against the terrorists. It is gratifying to note that most of the terrorist group leadership, has been decimated, while foot soldiers are abandoning their masters, burying their weapons in the forest and seeking solace. It is the achievements from harmonized efforts that have confirmed our stand that the insurgency would be ended as soon as possible. We would like to reassure @MBuhari Commander-in-Chief of the Armed Forces of the Federal Republic of Nigeria and indeed the good people. of our great nation that we would definitely meet up with the 3-month deadline and do the nation proud.” the statement said.